They’re sold in the day and bought through the night. Did you watch the 40th anniversary special of Saturday Night Live? One of my all-time favorite SNL skits is Jesse Jackson reading “Green Eggs and Ham.” It’s Black History Month and Dr. Seuss’s 111st birthday coming up on March 2nd. In honor of that, I’d like to revisit Green Eggs and Ham and remind you of Mr. Jackson’s rendition. Many have read “Green Eggs and Ham,” but, in my mind, no one can top Jesse Jackson’s rendition. But many others have read “Green Eggs and Ham.” They include Senator Ted Cruz’s infamous “filibuster,” President Obama, Olympic speed skater Apolo Ohno, and NLF quarterback Tim Tebow. Click here to view them. Or, you might want to hear author Neil Gaiman, most known for the Sandman comic series and Coraline, read it for charitable purposes, or watch the creativity of Weird Al Yankovic’s version. So What Does This Have to Do With Sales? 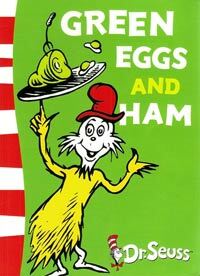 Green Eggs and Ham was written to help teach children to read. However, reading it as an adult what struck me is that protagonist Sam-I-Am, who ultimately gets his cohort to try green eggs and ham, is the greatest salesperson ever. Think about it. Sam-I-Am makes it look so easy but he really made over a dozen offers before he got to close the sale. Most customers don’t realize what goes on behind the scenes to sell a fabulous product or service. One of the most time-consuming (but worthwhile) endeavors is to set up a retail e-commerce website. To make it easier for you, we’ve taken the pain out of the process with our guide: 10 Legal Essentials for Your Retail E-Commerce Website. 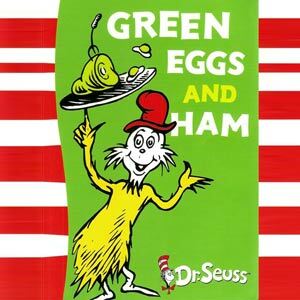 In Green Eggs and Ham, Sam-I-Am attempts to have another character, who is never actually named, eat some green eggs and ham. As a side note, Sam-I-Am is supposedly a cat. But what kind of animal is the unnamed character supposed to be?? He’s furry and has a crumpled hat with floppy dog like ears so he’s not a cat like Sam-I-Am, so what is he? Sam-I-Am is really the ultimate salesperson, isn’t he? Sam-I-Am continues to make offers. When his offer is rejected, Sam-I-Am just finds over a dozen different ways for the guy to try green eggs and ham. He offers to eat them in different places like in a house, a box, a car, a tree, a train, and a boat, or with diverse company such as a mouse, fox, and a goat. Or even in the dark or the rain. Sam-I-Am finally makes a classic maneuver: he offers a sample taster of green eggs and ham. The guy tries it, loves it, and ends up thanking Sam-I-Am! He is the arbiter of tactful persistence. And, like Dr. Seuss himself, Sam-I-Am made it look so easy! He’s holding this tray of food with one finger while in a box, driving a car, onto a moving train that skids upside down into a boat with random animals in tow. In selling our products or services, this is what we do every day. Our customers don’t realize all the things we do behind the scenes to “make the sale” and provide fabulous services or products. You can struggle through this process alone or you can let us help you. Want to your own sample “taste” tester? Join me for a Retail Speed Learning Educational Event on March 4th and get my new 10 Legal Essentials for Your Retail E-Commerce Website. Not only will it provide you with the legal information you must know, but it also takes the pain out of trying to figure out the practical business essentials know-how to get your e-commerce website making money for you. Be the Dr. Seuss of your industry and click here to request more info.